Situated in Northern New Mexico, Los Alamos is best known as the location of the Manhattan Project, a World War II initiative that helped usher the world into the Atomic Age. But there’s much more to this hilltop town—the same qualities that made Los Alamos a fitting remote outpost for top-secret research also makes it a diverse outdoor playground. It’s perched on the Pajarito Plateau, created by volcanic activity eons ago, between the Jemez Mountains to the west and White Rock Canyon and the Rio Grande to the east. Los Alamos is the gateway to three national parks - destinations that prove there’s plenty to explore when it comes to Los Alamos’ past and present. The dramatic landscape a dozen miles outside of Los Alamos that is now known as Bandelier National Monument was formed a million years ago of fire and ash. When volcanic explosions rained cinders over the landscape, the ash cooled into a soft layer of tuff. Over the centuries, the tuff eroded into Swiss cheese-like canyon faces that Ancestral Puebloans adapted into living spaces around 700 years ago. Today, you can wander Frijoles Canyon, walking amongst the remains of multi-storied adobe dwellings on the canyon floor and climb ladders into the cave dwellings. At Alcove House, towering ladders lead to a kiva (ceremonial chamber) that testifies to the complex rituals and lives of the people who once dwelled here. A recently renovated visitor center tells the story of these ancient peoples and is worth a stop. With more than 70 miles of trails running through the 33,000 acres of rugged and beautiful canyon country, there are both backcountry options and shorter trails to check out. Much of the backcountry is still recovering from the Las Conchas Fire of 2011, and while many of the trails have been reestablished, check current conditions at the visitor center before heading out. One of the park’s most popular hikes, Tsankawi, lies outside the main section. 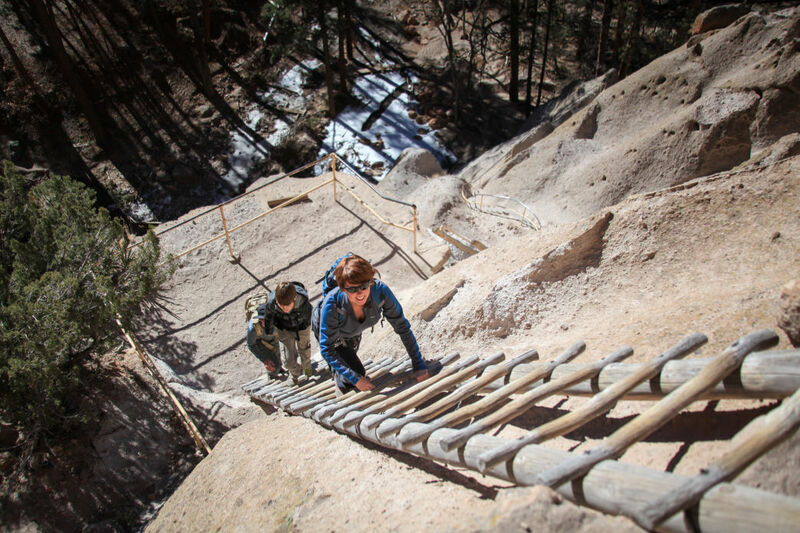 The short, 1.5-mile trail follows an ancient trail worn into the rock face and ladders up to an Ancestral Puebloan village. 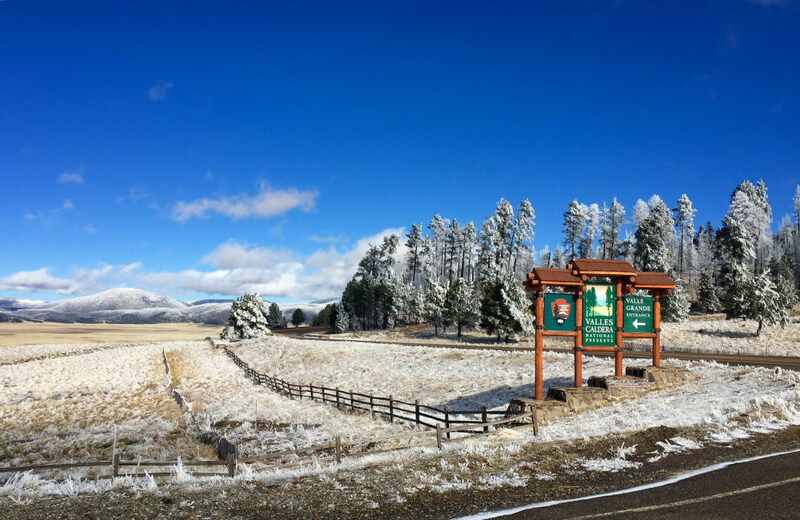 The same volcanic activity that shaped the Pajarito Plateau more than a million years ago also collapsed a great bowl known as the Valles Caldera. Today, the 13.7-mile wide depression is a popular destination for hiking and mountain biking (though its 8,000-foot elevation may mean those from sea level have to take it easy). With a wide meadow and surrounding ponderosa-forested peaks, many people look for wildlife like elk and turkey here, and trout fishing is popular in the waters that carve through the grass fields. 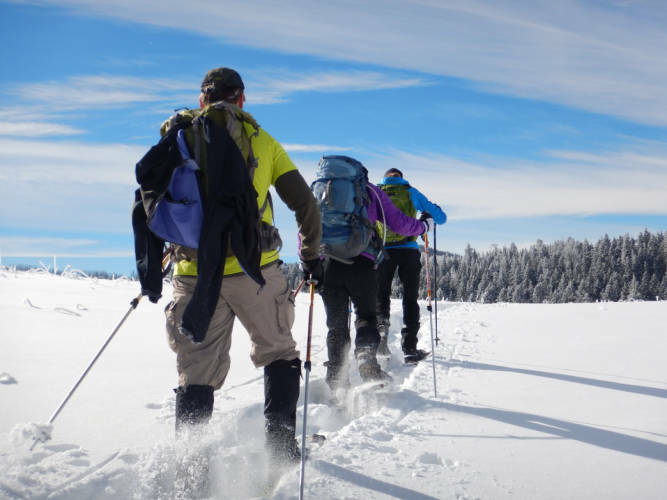 Valles Caldera is a four-season destination: Besides fishing year round, cross-country skiers and snowshoers crunch through the snow that blankets the valley here as early as Thanksgiving all the way through March. Established in 2015, the Manhattan Project National Historical Park includes three locales across the U.S. integral to the development of the Atomic Bomb: Hanford, Washington; Oak Ridge, Tennessee; and Los Alamos. At one point, the latter had some 6,000 scientists and support personnel designing and building atomic bombs. The official park includes three sites around the city. The "Little Boy" bomb was built in the three bunkers at the Gun Site Facilities. At the V-Site Facilities, lab staff assembled the first ever bomb test. And plutonium chemistry research was conducted at the Pajarito Site. 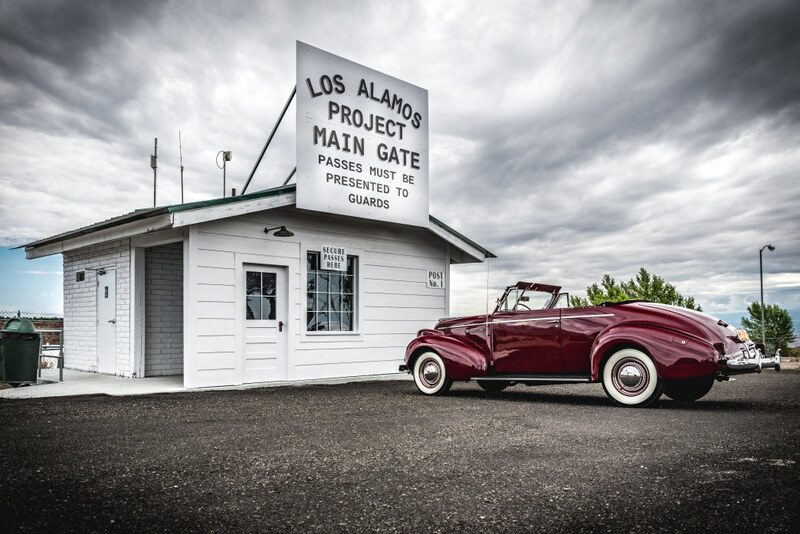 Unfortunately, there’s currently no public access to these spots, but there’s no shortage of sites to see in town, including a historic walking tour of downtown Los Alamos where many of the buildings have Manhattan Project Connections. ...make time to visit the Puye Cliff Dwellings at the Santa Clara Pueblo. The ancient inhabitants of what is now Bandelier National Monument likely traded with their neighbors at today’s Puye Cliff Dwellings. The site is similar to Bandelier, but there’s no cave climbing allowed here, just easy treks beneath the cliffsides that were once dwellings. The only way to visit the dwellings is to take a tour with a guide from the Pueblo of Santa Clara. The tours are led by the ancestors of those that live here, who paint the picture of life along the Rio Grande Valley some 700 years ago. The national historic landmark is one of the only sites of its kind in the Southwest that’s still controlled by the Pueblo peoples who trace their lineage here (the Santa Clara people now live in a village below). The Puye Cliffs grabbed Western tourism entrepreneur Fred Harvey’s attention, and he built a center at the base of Black Mesa in the late 1800s. It’s one of the few Harvey Houses that travelers had to reach via car as well as train, and it’s the only one built on a Native American pueblo. Today, the building serves as an interpretive center and gift shop. During summer, Native American artists often sell turquoise-and-silver jewelry under the portal, and tribal dancers move to a drumbeat in their traditional regalia on the back patio. While these are some of the bigger parks near Los Alamos, the county is home to 13 public parks, too. No matter where you plan to spend your time in the area, there is outdoor space just waiting to be explored!